In order to optimize your digital signage in order to achieve a customer engagement level that satisfies your expectation, you must ensure that you’re doing everything in your power to engage your audience. 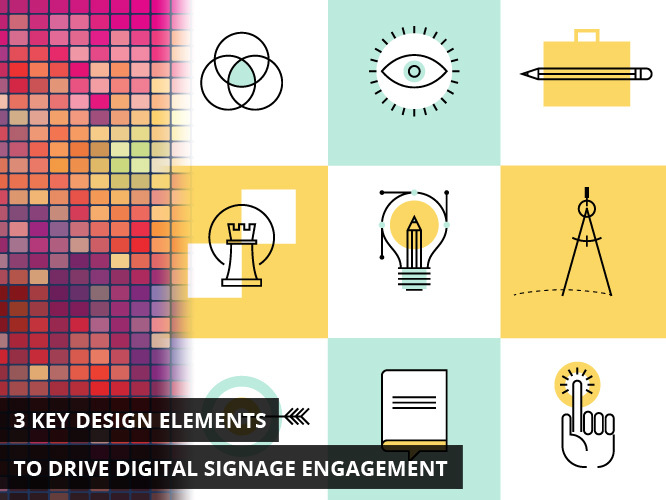 There are several key design elements in driving digital signage engagement and we will examine a few of them here. The message that you are trying to communicate to clientele should be clear and concise in your digital signage. Comprehension should be instant. There can’t be a struggle to understand what your digital signage is supposed to mean to a customer. On average, you have three seconds to make an impact in the mind of a customer with your digital signage. If you’re unable to accomplish accurate communication of the message contained within your digital signage over the short span of three seconds then consider another design. No one is going to stand in front of your sign for minutes on end contemplating anything. Your clientele will catch a glimpse of it in a glance as they’re passing by. That’s it. For this reason, your text should be kept no longer than two sentences – the shorter, the better – and your use of color should be effective in communicating the emotions you want associated with your business. Just remember you have a three-second window. That’s all there is. Combine your message with content that is relevant to the local community will help increase the attention it receives. Think of the time of year and include details of the weather or the seasons. Utilize reference to a current event in entertainment or sports and use that reference in a way to highlight your company’s products and/or services. The art of using relevant content depends upon you keeping up with current events and requires you to keep your content regularly updated. Employing variety and switching up the appearance of your campaign will keep people looking your way every time they pass by. There’s no need to undergo a drastic change in image or color but a few changes here and there can work wonders. If your digital signage includes text then it wouldn’t hurt to change the text regularly to emphasize different aspects of your campaign. Give your audience an action and the opportunity to participate in your business through a message that directs them to make a decision. Maybe you want to up your Facebook Likes and thus you include “Like us on Facebook” in your digital signage. Perhaps you want to direct them to your website. Depending on the business, you may want to invite them inside of your location to take advantage of a special offer only available today. You want to let your audience know what you want them to do. If there isn’t a direct action set in your digital signage then at that point, it simply becomes an image and nothing more. You’re not engaging anyone if you’re unclear on the message and not making an attempt to close the customer on a point. If you want to drive engagement in your digital signage then interaction is key. With these three key points, one can significantly improve on the effectiveness of their digital signage. Keep these three rules in mind. Digital signage can be a healthy investment for a business if you know how to use these three key design elements correctly. These can significantly increase the shopping experience as well as increase sales. 60% of all purchasing decisions are made in-store and the ability to grab clientele as they pass by your business can be an important skill. Digital signage can assist in drawing attention to your business while increasing awareness of your brand, which at the very least, it will do. Through effective digital signage use, the local community will get to know your business. Careful positioning, engaging content, and a call to action are all important in having a dramatic impact on increasing sales for your business. Remember. Ensure that your message is clearly communicated with every word and every color. Keep the content regularly updated and attractive to your audience. Regularly invite customers to interact with your business either in-store or online. Watch these three design methods increase engagement and within weeks see a noticeable improvement in sales.